A cinematic period tale of indigenous outlaw John Kepe (Ezra Mabengeza), Sew the Winter to My Skin explores the story of the Robin Hood legend and stock thief who, from the 1920s to the 1950s, is said to have stolen livestock and supplies from rich white people and given to the poor, indigenous people of the Karoo. 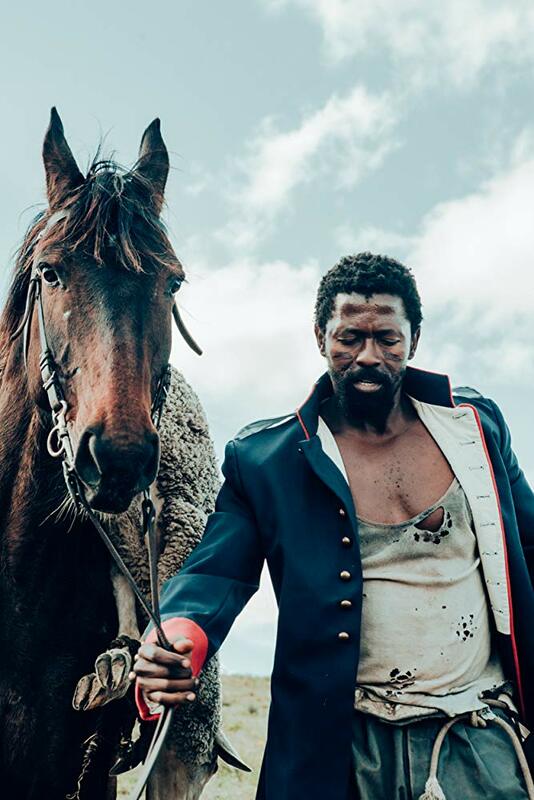 The film, a South African Western-style epic, is set in a time when apartheid was being written into law and Afrikaner nationalism was rising. Written and directed by award-winning filmmaker and screenwriter Jahmil X.T. Qubeka, Sew The Winter To My Skin has been selected as South Africa’s official submission to be considered for a 2019 Oscar nomination. The 91st Academy Awards will take place on 24 February 2019. “Growing up in a South Africa on the brink of major revolutionary transition, my need to create a version of reality that encouraged the possibility of dreams was essential to my development as a storyteller,” says . Decades later, I have found my voice, and the world has affirmed it,” says Jahmil X.T. Qubeka. Local farmer and Ossewabrandwag General Helmut Botha (Peter Kurth), an embittered World War II veteran, becomes obsessed with the capture of the notorious Kepe and leads an epic manhunt for him through the mountains, where he is rumoured to occupy a mysterious cave. Evading capture for more than a decade, outwitting Botha and his posse, Kepe’s raids become ever more brazen and his escapes from the authorities ever more daring. The outlaw’s legend grows in the hearts and minds of the poor and marginalised indigenous population, and the self-proclaimed “Samson of the Boschberg Mountains” emerges as both an enigma to his pursuers and a romantic object of adoration for his fellow victims of oppression. With Kepe’s very existence representing a threat to the inevitable march of colonial displacement, the hunt to capture and kill the outlaw reaches a desperate crescendo, and his mythological status as a folk hero and symbol of resistance is cemented forever. Jahmil X.T. Qubeka.’s documentary and feature film work has received accolades, awards and critical acclaim at prestigious international film festivals including Toronto International Film Festival, International Film Festival Rotterdam, London Film Festival, and Pusan International Film Festival, amongst others. In 2005 an AIDS documentary he directed for Sesame Street won a prestigious Peabody Award in America. Among his many successes, Jahmil was the 2014 South African Standard Bank Young Artist of the Year in the Film category. 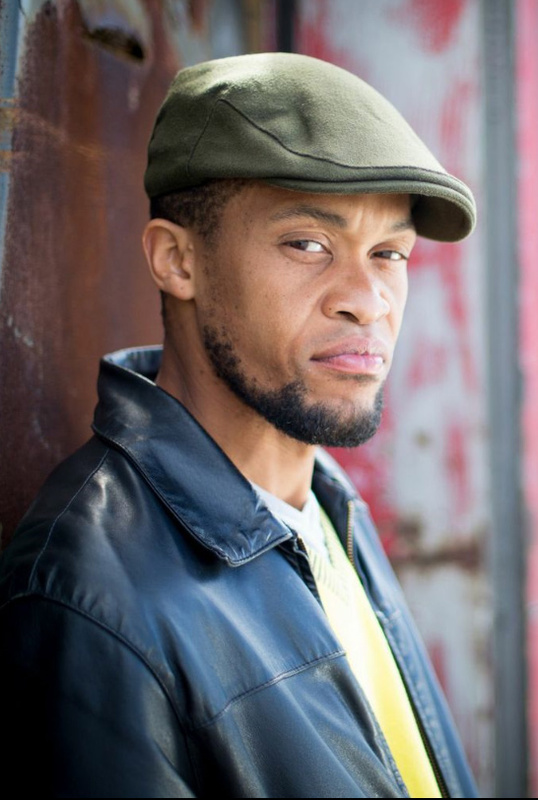 Jahmil is currently working on several directorial projects, including the gritty South African boxing story Knuckle City which has just completed production and the large-scale Hell’s Bells – about the sinking of the SS Mendi. Spending time in my mother’s hometown of rural Somerset East exposed me to the legend of John Kepe, and the epic nature of his capture, the spiritual poetry of his calling, the impending horror of Apartheid and the power of the man’s fervent belief in something greater than himself drew me to his intriguing tale. Kepe’s story remains embedded in the town of Somerset East, well established as a symbol of revolution. Members of the black community in this town, still impoverished, continue to build upon the narrative with increasingly creative versions. Sadly, today’s continuing division along racial lines in the indigenous population of Somerset East still enforces the relevance and necessity of a figure like Kepe, a symbol of resistance to oppression. My earliest memory of film was from the age of 6. Residing in Mdantsane Township in the Southern Eastern region of Apartheid South Africa, my father brought home a VHS machine and two flicks. One was the spaghetti western The Unholy Four by Enzo Barboni; the other a kung Fu picture called Little Superman (go figure). Enthralled by the premise and promise of the cover art, I started imagining what would happen, and fell in love with film iconography before watching a single film. Pushing myself stylistically, narratively and visually to aim for the full potential of concepts and artistic methods I touched on in my sophomore feature film Of Good Report, Sew the Winter to My Skin takes the potential of minimal dialogue to enhance the power of visual storytelling to its full manifestation. In its purest essence, this film is a motion picture driven by sensory and emotional experience. With this film, I am endeavouring to create a visual experience that crosses the boundaries and limitations of spoken language. It is my intention with projects like this to explore and to dissect the impact of the Apartheid experience on the psychology of self. The very roots of external struggles such as land redistribution are inherently imbedded in an internal meditation or yearning. Dignity seems to be the pursued pot of gold at the end of this rainbow. I wanted to offer some insight into what I believe to be mankind’s inherent need to feed into mythologies that conveniently suit the order of the day. Telling an uniquely authentic South African tale in the epic scale of the action adventure films of my childhood like Spielberg’s Raiders of the Lost Ark, Kevin Costner’s Dances with Wolves, Kotcheff’s First Blood and Mulcahy’s Highlander and fusing this with elements of the grandiose American westerns of John Ford, Sew the Winter to My Skin is a dream manifested. My choices for aesthetic approach and style of Sew the Winter to my Skin are primarily related to the communication of an image and an icon. I wanted to offer a view of South Africa that goes beneath the surface of our beautiful landscapes and interrogates what is lost in the translation of spoken words in a nation so inherently diverse. Watching the films of Jean – Jacques Annaud, I was inspired by the profound impact particularly of Quest for Fire and The Bear, both of which are very plot driven yet have no dialogue – the plot was made so clear visually that there was no need. I love films that have a visceral, visual narrative because for me story is everything. To take story and strip it down to its bare essentials is something I am riveted by – I wanted to make a film that was clear in its communication to such an extent that it didn’t require too much spoken word, a celebration of cinema and an ode to the visual medium. Shooting the film in the town where the legend took place had its challenges. We were entering a region that is unaccustomed to film production, in a town that still struggles with divisions along racial lines. Our main set for the Botha Farm, belonged to a farmer who was alive when the capture and hunt for Kepe took place, and in fact the very farm where he was captured. The shooting of the riot scenes and scenes of brutality brought up intense emotions for the locals in the black townships, who recalled these days all too well. There were mixed reactions to us filming this story as the wealthy farming population still do not see Kepe as a hero, and he is not a figure the majority of this population look upon with any reverence or respect. They consider him a cold-blooded murderer who deserved to be hanged. 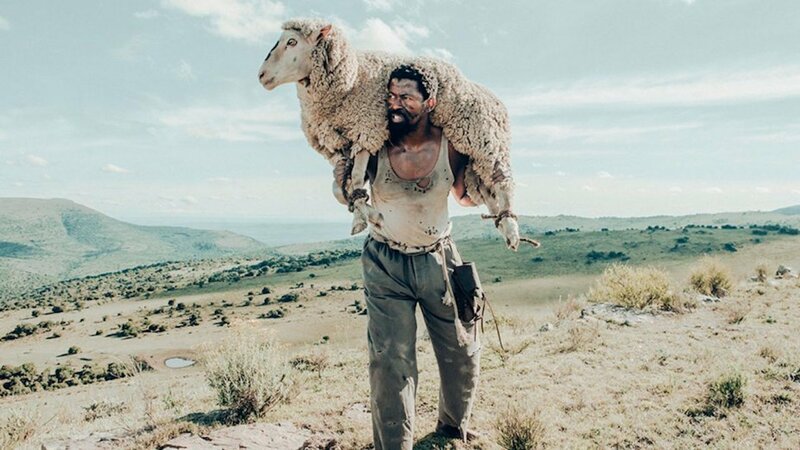 Kepe’s essence and restless energy affected all cast and crew as we made the long one hour journey up the Boschberg Mountains every day throughout what was a very tumultuous shoot. With the summer elements in the Karoo South Africa challenging us constantly with freezing, misty, and even snowy days, his bold resilient spirit kept us pushing to the end. 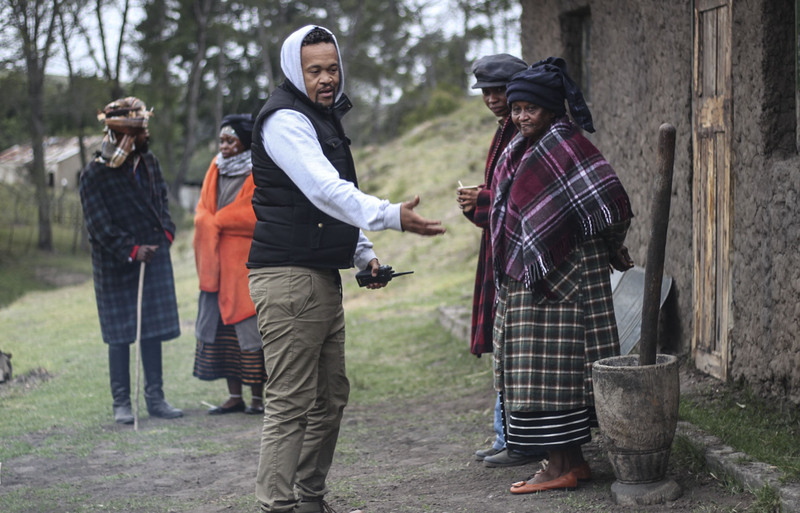 It is unjustifiably rare still within our South African film industry for a black director to have the opportunity to frame his own history through film, and the black perspective of black heroes in South Africa is almost non-existent within this medium. 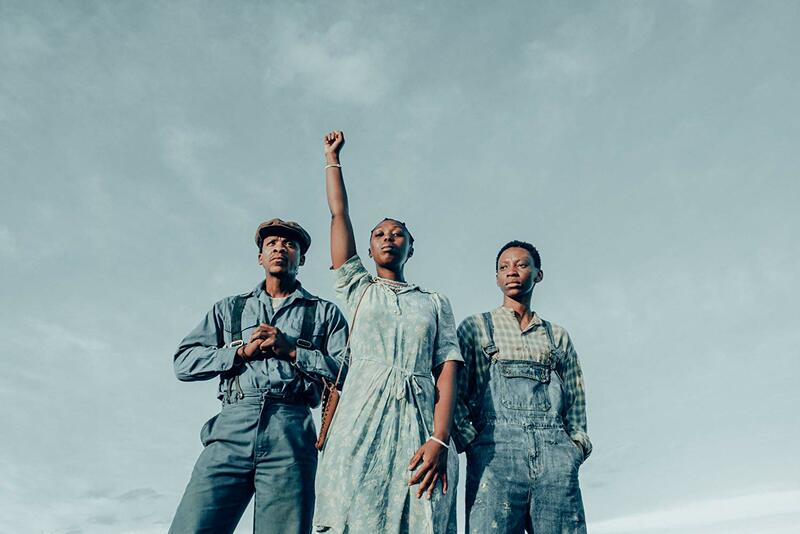 This film is as important for the canon of South African cinema, as it was important for the population of Somerset East who had never truly reflected on the impact of this rebel hero upon their collective psyches. The palpable discontent and discomfort within this divided community touched the very fabric our film and made the re-telling of this story all the more profoundly necessary.